Why should we plant buffers? Do you have open land up to the river? Whether a large floodplain field or a small backyard next to a brook, streams still need woody vegetation. We can help! 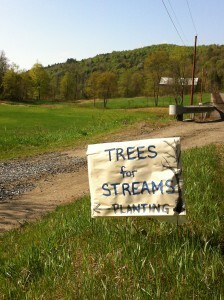 Our Trees for Stream program provides grants to landowners in Caledonia County to help design, plan and coordinate the planting of a stream buffer on your property. We’ll pick up the tab for everything but request cost sharing of 20% on the cost of the trees and shrubs. We use local student volunteers for plantings, and select site appropriate species. What size/width should a buffer be? We recommend a buffer width of at least 35-feet, starting at the top of the bank. If there are unique concerns on your property, or habitat considerations, our program would support a larger buffer project as well, 50-100′. We have also planted smaller buffers where we can still achieve benefits.